Customer Service. Right at your fingertips. A company can show its customer dedication right from the sales process, but keeping clients long term requires new standards in customer care as well. Expectations grow with time and volume of investments, user needs can be satisfied only with the latest and greatest customer service systems. Answer questions and provide assistance day and night through multichannel platforms in addition to personalized 1-to-1 journeys. Increase loyalty and satisfaction which leads to more sales. Nonstop assistance. In an effective way. Customers can face issues regardless of time, they may even ask for help on the go. Free up your call-center with creating knowledge base and communities. Customer support agent should work only on unique and high priority incidents, the rest of the cases can be handled with applied best practices. Users need immediate answers, in case it requires human assistance it is a key to find the right channel that navigates the customer to the most certified agent instantly. Familiar environment feels like being home. Multichannel customer care. Reach customers in their favorite communication platforms. Kind and professional assistance is the basic of customer engagement, but users have to navigate comfortably and confidently in the system, do not risk losing customers because they give up searching for solutions without success. Live Agent – a real time chat software – helps serving the client such as social network portals build bridges between companies and customers. VIP clients often request video assistance: customers virtually sit at the same desk with service desk agents regardless where they are in the world. Share desktop to show the right steps, reproduce errors to find solution and close the case faster without groping in the dark – even from mobile. Meanwhile at the customer service desk your agent can see everything about the customer: full history, previous issues with applied solutions, as well as suggested articles for the currently upcoming problem. It is easy to find the correct manual without asking recall option from the user. First case first. Only with the best possible support. Omni-Channel routing not just eliminates administrative work of manual case assignment, but it replaces it with intelligent automation. Customer Service agents receive cases as per their knowledge and certifications automatically with prioritization included: first things first, the staff starts working on the most important issues, but automation pursues solving old issues as well keeping the balance between time and criticality. All in all it makes your team integrated and customers satisfied. 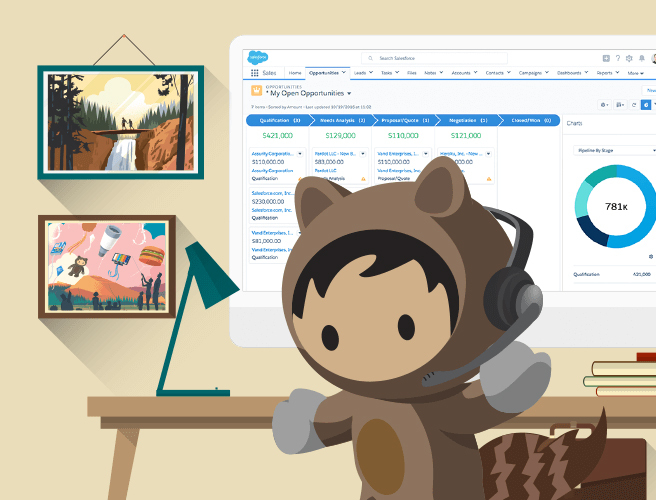 Be one step ahead of customers to provide customer service experience like nowhere else – only with Salesforce. seamless service journey of your customers. Familiarize yourself with Service Cloud’s Omni channel features, live video customer service experience or even with Field Service to invite colleagues on the field to the success of 21st century customer support. internal collaboration and digital commerce is becoming a differentiator of Salesforce. According to the report Service Cloud is within the top solutions for midsize companies no matter if the business profile is B2B or B2C. Learn more about how cloud technology will become increasingly prominent in the latter half of this decade.